Years in the making, the newest addition to the University of New Brunswick’s Faculty of Law was officially opened March 23. The La Forest Rare Books Reading Room along with the C. Anne Crocker New Brunswick Legal Heritage Collection were unveiled during a ceremony at the Gerard V. La Forest Law Library in Fredericton. The La Forest Rare Book Reading Room provides a secure, climate-controlled environment for the preservation of UNB’s important historic collection of legal materials. Keeping the documents safe and in pristine condition will benefit future generations of law teachers, researchers and scholars as well as members of the Bar and Judiciary. Among the rare materials housed in the La Forest Rare Books Reading Room are Commentaries on the Laws of England, Fourth Edition, by Sir William Blackstone published in 1771, as well as the Canadian Railway Act of 1903. The room is also home to the C. Anne Crocker New Brunswick Legal Heritage Collection which aims to preserve and reflect New Brunswick’s legal heritage. The collection brings together the province’s legal publications including law reports, legislation, other reports and texts, as well as legal sources from other jurisdictions that were consulted by New Brunswick legal practitioners and scholars in the 19th and early 20th century. The collection is named in honour of C. Anne Crocker, C.M., UNB Law Librarian Emerita, who helped cultivate the collection throughout her thirty–year career. In addition to preserving important legal documents for future generations, the La Forest Rare Books Reading Room also recognizes the accomplishments of the Honourable Mr. Justice Gérard V. La Forest, C.C. Justice La Forest’s career encompassed work as a lawyer, law teacher, scholar, senior civil servant, Justice of the New Brunswick Court of Appeal and of the Supreme Court of Canada. Justice La Forest has donated materials from his personal collection to the reading room including books, reports, articles, speeches, newspaper clippings, photographs and other memorabilia spanning his distinguished career. 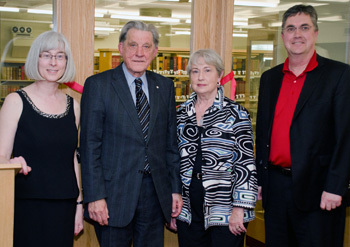 “The opening of the La Forest Rare Books Reading Room is wonderful because it not only preserves historic legal documents but also celebrates a great UNB alumnus and New Brunswicker in Justice La Forest,” said UNB president Eddy Campbell.